Wed April 15th - Duo Tandem, Necati Emirzade and Mark Anderson, is an instrumental guitar duo based in Chicago and London. 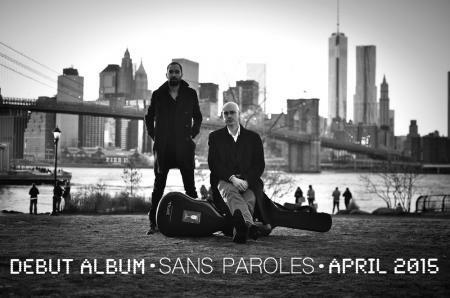 Their debut album San Paroles (Without Words) includes Brazilian choros, Argentinian tangos, the obligatory Chopin, and music written for Duo Tandem by Grant Ferris and David Gottlieb. Nashville based guitarist, composer, and songwriter Grant Ferris kicks off evening with solo set of works embracing American genres and styles. About Duo Tandem - Most musicians would not board an airplane simply to go to a rehearsal, but international travel is just part of everyday life for Duo Tandem. Having already established themselves as virtuoso solo performers, Necati Emirzade and Mark Anderson formed Duo Tandem while studying at the prestigious San Francisco Conservatory of Music. What they discovered working together in San Francisco was a shared artistic vision that was worth continuing to pursue even after Mark moved to Chicago and Necati moved to London. Music can serve many purposes for Duo Tandem and that is reflected in their diverse repertoire selection. Performances include music ranging from the joyful to the experiential. The bottom line is that the music must be meaningful; Necati and Mark seek to delight, excite and intrigue. Having now performed throughout the US, in the UK, and in Cyprus, Duo Tandem has been acclaimed as ‘Magical’ (Marc Teicholz) and praised for their ‘beautiful articulations, rhythm, and timing’ (Larry Ferrara). Duo Tandem is getting ready to release their first album Sans Paroles in April 2015. Sans Paroles (without words) includes recordings of some tangos and choros (the very music Necati and Mark first played as a duo) as well as music written for them by their friends Grant Ferris and David Gottlieb. Also working towards the future, Duo Tandem is writing and arranging more of their own music as well as preparing to premier a new piece written for them by João Luiz.